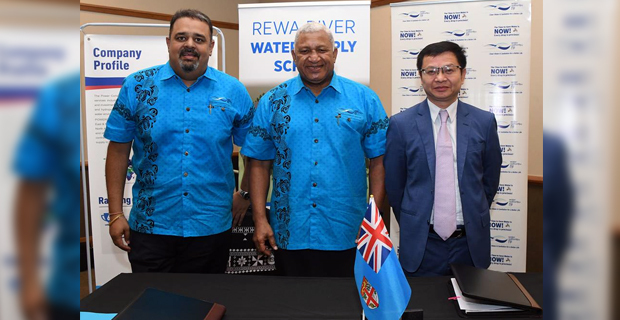 The government has today signed two contracts that pave the way towards the construction of the single largest infrastructure project ever managed by the Water Authority of Fiji which is the Rewa River Water Supply Scheme. This will benefit more than 300,000 Fijians. Prime Minister, Voreqe Bainimarama says the total value of these two contracts stands at 266 million dollars and covers the design, construction and operation of the Rewa River Water Supply Scheme, along with the procurement of pipes, fittings, civil works, pipe laying and restoration works, where required. Bainimarama says construction is expected to take two to three years to complete. He says this is a landmark investment that will ensure a clean and reliable water supply to people, making every cent of that sum well worth it. Bainimarama thanked the Asian Development Bank, the European Investment Bank and the Green Climate Fund for their support towards this project. The support is in the form of both financial assistance and their invaluable expertise. The Prime Minister says if we want Fiji’s progress to continue, we need to ensure that our water infrastructure is suited to meet our future demands. He says otherwise, we will be setting ourselves up for a water crisis of historic proportions. Bainimarama says because of this massive expansion in our water production capacity, when Fijians a decade, two decades and three decades on from now turn on the tap, they will see a steady stream of clean and affordable water. The Prime Minister says it only takes a drive around Suva to realise very quickly that not every government used to consider the long‑term realities of our nation’s development. He says the roads were not originally designed to be widened and expanded; basic services infrastructure was not catered for future growth; and trends in demographic movements were not factored into decision‑making. Bainimarama says those governments acted for today, without thinking for tomorrow. The Prime Minister says as of now, Fijians in the Suva‑Nausori corridor get their water through the Waila and Tamavua water treatment plants. But the Suva‑Nausori area, already the largest population corridor in our nation, is growing even larger. Bainimarama says the strain on these existing systems is mounting, not only as the population grows, but as longer droughts, a result of climate change, threaten existing water sources. The completion of stage one of this scheme will add a minimum production capacity of 40 megalitres per day to our national network of water infrastructure. But this new water system is built in such a way that production can be further expanded as demand continues to grow. Stage two of construction will double system capacity to 80 megalitres per day, and stage three will enable the system to generate, at minimum, 100 megalitres of water in a day. Bainimarama also says that the Rewa River Water Supply Project is only one piece of a massive Urban Water Supply and Waste Water Management Project undertaken by the government, a project which will expand and upgrade water and wastewater infrastructure to the tune of 855 million dollars. He says over 300,000 people stand to benefit from that investment, by enjoying more reliable access to clean water and leading healthier lives.